Project Rachel in the Diocese of Rochester has a network of specially trained priests, religious, counselors, and laypersons who accompany anyone struggling in the aftermath of abortion. It could have been recently or several years ago. You may have experienced an abortion yourself or be the partner, parent, grandparent, sibling, other family member, friend. A trained companion is available to guide you on a confidential, nonjudgmental healing process of forgiveness and peace. It doesn’t matter what faith tradition you are from or if you don’t adhere to any faith. Everyone is treated with respect and consideration. All services are offered at no cost. If you or someone you know needs hope after abortion, confidential, nonjudgmental help is available through our dedicated helpline: 888-9RACHEL (888-972-2435) . You can also email us at return2peace@rachelroc.org. 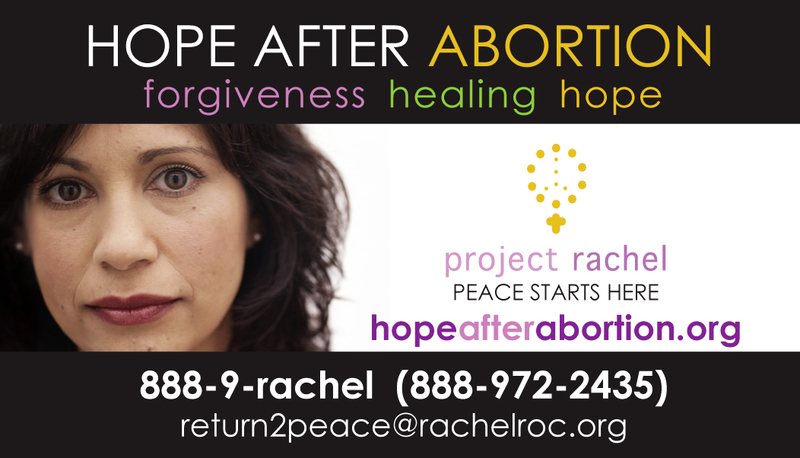 Check out the national Project Rachel website at hopeafterabortion.com.